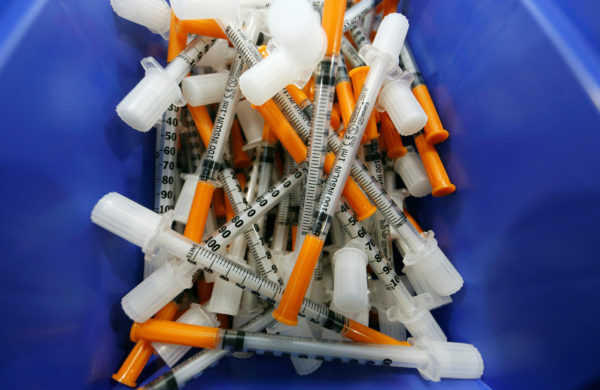 Syringes are seen at the SCMR (drug supervised injection site), the first supervised injection room for drug users, in Paris, France, on October 11, 2016. AUGUSTA, Maine — A proposal to create two so-called safe houses in Maine where people could take illegal drugs with supervision from medical professionals hit a wall of resistance Friday in the House of Representatives. Supporters of the measure cited data and anecdotes that showed facilities like the ones proposed in LD 1375 save lives, but opponents said the concept was flawed and would divert resources that would be better spent on drug abuse prevention and treatment programs. and to provide clean and safer drug paraphernalia such as syringes. The bill, which has an estimated cost of more than $300,000 a year, also contains provisions to exempt staff or the operators of the facility from criminal liability. Rep. Michael Sylvester, D-Portland, the bill’s lead sponsor, framed his argument around whether the Legislature is ready to help drug users or punish them in their hour of need. He said facilities like the ones in his proposal are working in locations all over the world. Opposition to the measure was as passionate as the support. “Instead of cutting right through to letting people do drugs, we should get into getting them off drugs,” said Rep. Dwayne Prescott, R-Waterboro. Rep. Deborah Sanderson, R-Chelsea, said she is worried that creating such a program would send the message to children that doing drugs is OK in certain situations. The House voted 98-47 against the bill, which faces more votes in both chambers. Even if it were enacted, it would have to find funding, which is especially difficult this year because of a raging impasse over the state budget.